Over the weekend, before a court ruled on their fate, Benny Tai Yiu-ting, Dr Chan Kin-man and the Reverend Chu Yiu-ming returned to where it all began. They went to seek solace not just in their faith but also supporters as they appeared at Kowloon Union Church on Saturday afternoon in an emotional gathering of prayers, tears and aching acceptance that the journey was coming to an end for now – the road over, the cause shelved. “If faith is all about pursuing justice, as long as there is injustice in society, our faith will be to carry on the struggle,” Tai said as his eyes reddened and the crowd applauded and sang. That struggle began six years ago in the same red-brick building when the trio launched their “Occupy Central with Love and Peace” campaign. The three, who had more black hair than white back then, had vowed to mobilise 10,000 people to block roads in the city’s business hub to fight for universal suffrage. No one thought their civil disobedience campaign – which many had poured scorn on – would go on to become a movement a hundred times bigger by September 28, 2014, unleashing a powerful force of unity few had anticipated. In the end, the mass protest paralysed parts of the city for 79 days, but it altered Hong Kong’s political landscape permanently. 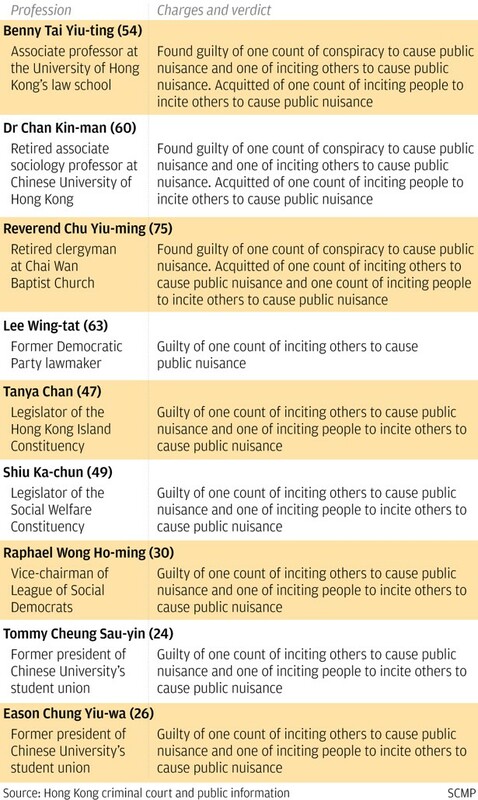 On Tuesday, Tai, along with Chan, Chu and six others, were found guilty by a Hong Kong court on charges relating to public nuisance for their roles in the 2014 sit-ins. With this verdict, all of the prosecutions over Occupy were over. a total of 293 cases – 168 criminal and 125 civil – related to the Occupy movement had been or were being dealt with at various levels of the courts, according to the judiciary. Occupy student leaders Joshua Wong Chi-fung, 22, Nathan Law Kwun-chung, 25, and Alex Chow Yong-kang, 28, were jailed by the Court of Appeal for six to eight months in 2017 for storming a government compound and, effectively, triggering the Occupy protests. But they walked free last year after the city’s top court ruled their original non-custodial sentences were manifestly adequate. Wong, who has resumed his Open University of Hong Kong studies, is appealing his three-month jail term for another protest during Occupy, arguing it should be quashed in favour of a non-custodial sentence. Chow is now a doctoral candidate in geography at the University of California, Berkeley. Law is set to begin a one-year master’s programme at Yale University this autumn, fully funded by a scholarship from the school’s Council on East Asian Studies. He said he hoped to better equip himself for the long-haul battle for democracy by furthering his studies. As the fifth anniversary of the movement looms and with the final prosecutions dealt with, the city is far from achieving universal suffrage. The question that begs asking is: was it all in vain? Did the Occupy founders feel they brought about a lot of good or left only a trail of disappointing outcomes? After Occupy ended, a number of youth-led pro-independence groups began emerging from about 2015, campaigning on the notion that breaking away from China was the only viable way for the city to be truly free. Several who had cut their teeth during the Occupy protests – including two separatists Yau Wai-ching, 27, and Sixtus Baggio Leung Chung-hang, 32 – had their first taste of victory in the 2016 Legislative Council polls. But their elation was short-lived as the duo immediately earned the displeasure of Beijing. They were disqualified for their oath-taking antics. Not long after, four other pro-democracy lawmakers were similarly turfed out, also for improper oaths. Election bans on anyone who supported anything from self-determination to outright independence were then enforced. The DWF always needs your help to educate the public on the ideas of World Federalism and humanity’s advancement to a peaceful and rich society. In 2018, the administration took another unprecedented step to outlaw a separatist group, the Hong Kong National Party. It had already expelled British journalist Victor Mallet for hosting a talk by party leader Andy Chan Ho-tin at the Foreign Correspondents’ Club. Last month, the government tabled a proposal to allow the transfer of fugitives to any jurisdiction which Hong Kong lacks an extradition deal with, including mainland China, sparking fears that the city would be sending people across the border to face a court system not known for its independence. Citing these seemingly unending moves, observers from both sides of the political spectrum agree that politics has changed in the last five years. New red lines have been drawn. Beijing has tightened its grip on Hong Kong, as fears grow about the city’s autonomy guaranteed by the “one country, two systems” guiding principle. But critics say these changes are tantamount to a crackdown. They say the city is paying the price for Occupy. Dr Chan dismissed the suggestion, saying: “It is not a natural consequence that an authority must respond to mass-scale unrest with a crackdown. The colonial government, for instance, looked into the discontent of the youth and introduced a number of social measures in the wake of the leftist riots of 1967, he said. impatience over the political stalemate was boiling over. In the 18 months before Occupy, the co-founders emphasised the importance of non-violent struggle and introduced concepts such as civil referendums and deliberation days to engage the public. “Just imagine if we didn’t spend that year talking about peace and non-violence … it could have been a bloody battle,” Chan said. “It would have been like the ‘fishball revolution’ in Mong Kok, but a hundred times more serious,” he explained, referring to the unrest that erupted in 2016 when a hawker control operation in the shopping district turned ugly. But the crackdown is just one facet of the reverberating consequences of Occupy. Politically, both pro-democracy activists and pundits have come to recognise that another round of political reform attempts might not happen for at least another decade. However, even if Beijing were to have a change of heart and agree to political reform, they are sceptical the framework would be any better than the plan rejected in 2015, which effectively allowed the central government to vet chief executive hopefuls before a citywide ballot. The pessimism deepened last year when Beijing scrapped term limits for the nation’s presidency, paving the way for strongman Xi Jinping to stay on beyond 2023. “That’s when the pro-democracy supporters fell apart,” Cheng, of Baptist University’s department of government and international studies, said. Until then, activists and supporters alike were still hopeful they could keep up the fight, even amass again in future, he said. But with the disqualification, the realisation set in that the government would have little compunction in unseating lawmakers duly elected by voters. “They found out there is actually no way out,” he said, explaining the sense of defeat. Indeed, the widespread sense of cynicism has become the biggest obstacle the pro-democracy bloc has had to wrestle with in recent years. By Becoming a member of the DWF, you help to keep us by running our basic operations and promoting our ideas. election since the city’s handover in 1997, suffered two jaw-dropping defeats in 2018. Chan said he did not believe Hongkongers’ values and appreciation of their freedoms had changed, but conceded the sense of hopelessness and cynicism could linger for years. “There is a cycle,” he said. Former Democratic Party lawmaker Lee Wing-tat, one of nine Occupy players found guilty, said many young people were left depressed because they had thought democracy could be achieved in one go, merely through the sit-ins. Part of the reason was the disunity among the top ranks of the Occupy leadership. The student leaders and the Occupy founders fell out in the midst of the protests as they could not agree on when to call an end to the demonstrations. The review also did not take place as the young activists came under the double whammy of pressure from Beijing and more radical localists, who accused them of being too wishy-washy. Several of them, under the weight of the pressure, also found themselves too traumatised to talk about what had happened, say insiders. Victoria Hui Tin-bor, a political scientist at the University of Notre Dame in the United States, said it was important for the leaders of the pro-democracy camp to stay non-violent and instil hope during the low time of the social movement, which is set to be drawn-out. “Claim victories, however small, to keep up the hope,” she said. Cheng, of Baptist University, agreed. He said the lack of “small victories” over the past few years had made the pro-democracy bloc lose the momentum to mobilise supporters. The camp, hemmed in by limited resources, should not try to address everything but instead focus on a few agendas that could actually challenge the government, he suggested. Cheng said the ongoing debate over the controversial extradition deal, which has drawn the ire of even the international and local business sector, was a good starting point. In the long run, he said the camp should seek to obtain cross-sectoral support by, for instance, exploring the possibility of engaging the business community. Despite the setbacks, Occupy campaigners said the movement was not a fruitless struggle. History would judge them, they said. At the very least, they argued they had stopped the city’s unpopular leader Leung Chun-ying from getting a second term in 2017, and inspired professionals to be more engaged and vocal in the fight by setting up pro-democracy groups in their own sector. “In terms of the goal [of achieving universal suffrage], of course we failed,” said social welfare sector lawmaker Shiu Ka-chun, one of the nine convicted leaders. “Apart from that, we have learned not to bow down to fate, have staged non-violent resistance attended by more than 1.2 million people, and maximised public engagement over democratic development,” he said. The three Occupy founders were also unmoved by any notion of failure. They have formed a special bond throughout their journey and are now prepared for the worst. Chu and Chan have known each other for several decades, since Chan was a university student, and the pair later connected with Tai after he named them as potential co-leaders for Occupy in a newspaper interview. Chan insisted it was not a mistake to reject the reform plan in 2015, which would have allowed Hongkongers to pick their leader through “one man, one vote” in 2017. Back then, there was a call to just “pocket” the offer first, and think of changes down the road. But Chan said: “If we had pocketed it, Beijing would claim it has already fulfilled its constitutional responsibility to grant Hong Kong universal suffrage – even though there’s a screening process for candidates. In his written submission to the courts, Tai declared he was not afraid or ashamed of going to prison. “If this is the cup I must take, I will drink with no regret,” he wrote. The 54-year-old legal professor said the cup was not about his ordeal in jail, but the adversity Hongkongers faced in their vain search for democracy. “I will hold on to my last breath, regardless of whether it is a success or failure,” said Tai, who stands to lose his job at the University of Hong Kong. For Chu, the 75-year-old who has devoted himself to the democracy fight for decades, his hope was to see his church peers speak truth to power. “I hope each of us can bring others hope in our own position so it would stop people from sinking into despair,” he said. His wish was that the conclusion of the trio’s trial would lead Hongkongers to reflect on what Occupy had or had not accomplished. “If the three of us, two academics and one old pastor, are locked up, will we bring some reflection for Hongkongers which in turn enlightens them with an awakening?” Chu said. Jeffie Lam joined the Post in 2013, after beginning her career as a political reporter in 2009. She is a senior reporter and writes predominantly about Hong Kong politics, but she is also interested in social welfare issues, such as the ageing population and elderly care. She won the English features merit prize in the 20th Human Rights Press Awards in 2016.